Dozens of federal agents scoured the family property of YouTube celebrity Kyle ‘FPSRussia’ Myers while searching for illegal explosives and possibly weapons, but left empty-handed. The noise made by popular YouTube channel FPSRussia – famous for destroying man-made mechanisms with the most advanced firearms – has finally been heard in federal quarters. On Wednesday, Alcohol, Tobacco and Firearms (ATF) agents accompanied by FBI agents launched an operation at two locations in Georgia, looking for illegal explosives allegedly used by FPSRussia to produce its YouTube clips. The ATF suspected Kyle Myers, the iconic 26-year-old host of FPSRussia, of using explosives “with malicious intent,” Onlineathens.com quoted ATF spokesperson Richard Coes as saying. Coes cited the cars, fridges and other objects that were regularly blown up on Myers’ channel. 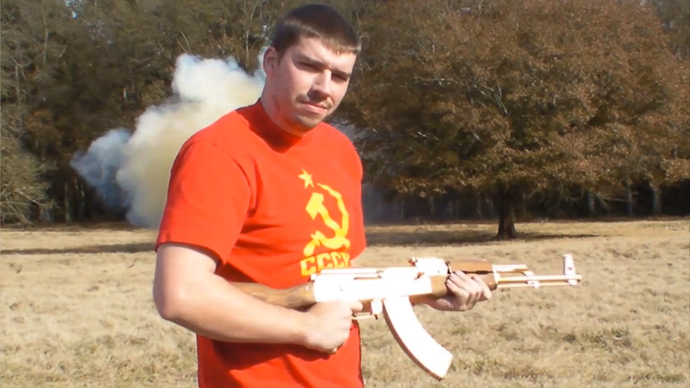 With nearly 4 million subscribers, FPSRussia is one of the most popular YouTube channels, and is dedicated solely to guns and shooting – and explosions. In the channel’s videos, Myers speaks with a strong Russian ‘accent’ and demonstrates the use of exotic modern and vintage weapons, or anything else that can be shot, be it a WWII Soviet submachine gun, a 50-calibur sniper rifle, a flying drone, a rocket launcher, a tank or a cannon – practically any weapon that’s still functional. Federal agents and sheriff’s officers raided the Georgia residence of the Myers family in Royston, as well as the 60-acre farm owned by Kyle’s father Lamar Myers in Lavonia, where FPSRussia’s famous shooting range and testing area are set up. No illegal explosives were found and no arrests were made, but considering the unprecedented arsenal stocked at one of the locations, the agents considered confiscating Myers’ weapons. “The idea at one of the locations was to take firearms, but they did not do that,” an ATF spokesperson said, according to Onlineathens.com. As was apparent in FPSRussia’s videos, Myers had used Tannerite – a patented binary explosive traditionally used as a target for firearms practice, because hitting a target is accompanied by a resulting boom. Tannerite is famous for its exceptional stability and can only explode when directly hit by a bullet – even striking it with a hammer won’t blow it up. The extensive use of this explosive for purposes other than shooting practice possibly put federal agents on alert for any kind of explosive that would have meant FPSRussia’s producers were in violation of federal law. Officially, the ATF regards FPSRussia as a commercial undertaking, because “he [Myers] was using explosives and getting paid for it via YouTube.” If Kyle Myers is doing business in explosives, the ATF believes he should have had obtained a federal explosives manufacturing license needed “to engage in the business of manufacturing explosives for sale, distribution or for their own business,” the ATF spokesperson explained. The raids on the Myers’ properties were staged as part of an investigation into the death of 32-year-old Keith Richard Ratliff, who was found dead on January 3. Ratliff and the Myers family were co-owners of gun producer FPS Industries; Ratliff was also executive producer of the FPSRussia channel, acquiring or creating rare weapons for the show. Ratliff was killed by a single bullet to the head. Though a large number of firearms were found at Ratliff’s business premises, the murder weapon was not among them. The investigation continues, and so far no names of possible suspects or persons of interest have been revealed.